Right now, there are 320 children in the remote Mpigi District of Uganda who are on a waitlist to start school after Christmas. But we urgently need to purchase desks, chairs, stationery packs and uniforms by 8th January 2019 to confirm these enrolments and fit out classrooms so more children can get an education and reach their true potential. The impact on children in remote Uganda who don't have the opportunity to go to school is devastating. Without education, children are forced to do hard physical labour on farms, digging or hunting for food so they can feed themselves. Girls marry as young as 10 years old because their parents want to ensure their financial security. Plus, as many as 3 in 10 girls will have their first child before they turn 18 years old. The cycle of poverty that children are born into continues for the rest of their lives...unless they can get an education to break the cycle of poverty and create a better future for themselves. Uganda’s population is just under 43 million people, with 49% aged under 14 years – making it the fifth youngest population in the world. But only 3 in 10 Ugandan children finish primary school. The drop out rate is 60-80% as families struggle to pay for tuition, uniforms and books, and need their children to help at home or work to earn an income. But EVERY child deserves to go to school to get an education and reach their true potential. Donate a Desk and sponsor a child's education to enable them to start school in the remote Mpigi district of Uganda. School for Life has three fully operational schools, employing 120 local staff and educating 680 students from pre-school to year 7. We give children living in poverty a high quality education with motivated, qualified teachers, and a teacher to student ratio of 20:1. Our classrooms are filled with amazing resources like books, colouring pencils, paints and toys. We take a holistic approach to education and development in the communities we work, providing health and nutrition services, and agricultural and tailoring programs. Children get three nutritious meals a day, clean drinking water, access to health clinics and the opportunity for excursions and extra-curricular activities. 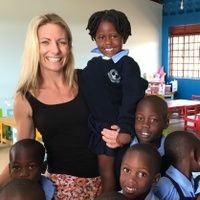 As a not-for-profit organisation, all of this is made possible because of our generous community of Australian supporters who share our belief that EVERY child deserves an education. But right now, we have hundreds of kids on our waitlist who desperately want to start school in the new year..
With your help, we can purchase desks, chairs, uniforms and stationery to enable more children to go to school and transform their lives. Donate a Desk and support a child's education. Your name will be displayed on your child's desk as a mark of your life-changing support. Choose from one of the following options to get more kids in the classroom and see the amazing rewards you'll receive in return. Provide a colourful wooden desk. Provide a colourful wooden desk and chair set. Provide a desk, chair, stationery pack & uniform. Provide desks, chairs, stationery packs & uniforms for 10 students. Provide desks, chairs, stationery & uniforms for 25 students. Our goal is to raise $97,000 by 8th January 2019 to purchase desks, chairs, stationery and uniforms to fit out classrooms and ensure that 320 kids in remote Uganda can start school on 29th January 2019. Together we can change these children's lives forever. Choose from some heart-warming and uniquely special gifts when you donate a desk and sponsor a child to start school. Rose Nakaye is just one of the many children whose future has been transformed through School for Life. She had lost all hope for life until she discovered School for Life. Rose lost her father when she was 5 years old and her mother was forced to abandon her children. Often there was no money for food, so she went without. Living remotely, she has no real friends and no support network. It was at her lowest point that School for Life came in to help Rose – providing her with not only education, but hope. Donate a desk and sponsor a child like Rose to start school and have the opportunity of a happy, healthy future. 320 children in remote Uganda are URGENTLY waiting to start school. Donate a desk to a child this Christmas and your name will be engraved on the child's desk to recognise your life-changing support. Your donation will provide a school uniform to a child living in poverty. You'll receive a hand-drawn card from a child. Your donation will provide a desk to a child living in poverty. Your name will be engraved on your sponsored child's desk and you'll receive a hand-drawn card. Your donation will provide a desk and chair to a child living in poverty. Your name will be engraved on your sponsored child's desk and chair and you'll receive a hand-drawn card. Your donation will provide a desk, chair, uniform and stationery pack to a child living in poverty. Your name will be engraved on your sponsored child's desk and chair and you'll receive a hand-drawn card and a Kumi pencil case. Your donation will provide desks, chairs, uniforms and stationery packs for 10 children. Your name will be engraved on their desks and chairs and you'll receive a hand-drawn card, a Kumi pencil case and a framed thank you photo. Your donation will provide desks, chairs, uniforms and stationery packs for 25 students. Your name will be engraved on a plaque in the classroom and you'll receive a hand-drawn card, a Kumi pencil case and a framed thank you photo. * $38,940 in offline donations included in total.